SSR LLC – GE – The Flannery Manifesto! GE – The Flannery Manifesto! A rebase of earnings for 2017 and possibly 2018 (which we believe will include a Q2 earnings miss) plus a first pass look at the incoming CEO’s plan of attack. Or a simple earnings report – likely a miss – and a commitment to a comprehensive analyst update in August – after the official CEO transition. Anything other than this will likely raise concerns further and send the stock lower. It is imperative that Mr. Flannery does a couple of things very quickly if he expects to be given the benefit of the doubt for more than a few months and avoids being painted with the “more of the same” brush. He MUST rebase 2017/2018 earnings expectations to levels that he can meet or beat. Even if those rebased numbers are a negative surprise. Continual negative guidance is missing estimates, is overconfidence – Exhibit 1. He needs to address what he is going to do to turn the company around; and this more than likely means that he needs to talk about divestments or separations. We see no downside in announcing now that the energy business will be spun off to shareholders as soon as is practical – lots of risk if he does not do this. Complex though the company and the issues may be, we do not believe that anyone is willing to wait too long for this sort of presentation – an analyst meeting in Q4 or Q1 with little in between except a story about “internal reviews” will not cut it. Someone with Mr. Flannery’s experience and tenure at GE does not need a 6-month review period – he should know what the major issues are already and the sooner he gives investors confidence around this the better. We would also like to see a moratorium on M&A effective immediately (except for the Oil Services separation) – it is much harder to hit a moving target than a stationary one; continual portfolio changes have likely been a hindrance to efficiency, in our view. Allow Mr. Flannery to start off with a clean slate and something he can build on. Or, if the company misses these reset expectations for 2H 2017, confirm that the business is too cumbersome to manage, resulting in a compelling case for break-up. 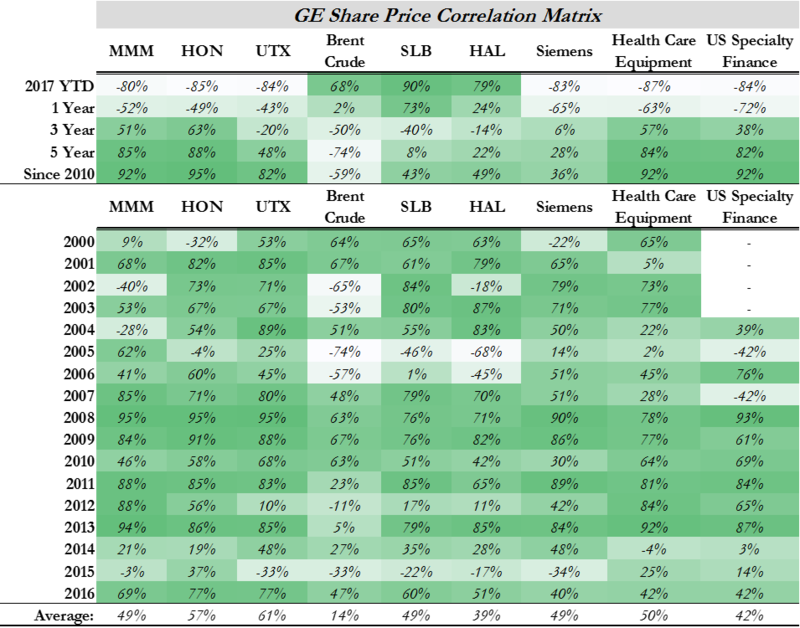 While the departure of Mr. Immelt was initially greeted with a positive stock response, the early gains have been given back and GE remains the worst performing large-cap stock year to date. It is one of very few stocks in the Industrials and Materials universe with activist ownership and a leadership change that is going backwards. A complete loss of confidence in what real earnings may be for the company, given how quickly Mr. Immelt left after resetting expectations for the year in Q1 (sends a signal that Q2 has not gone well), and given the disconnect between cash flows and earnings – only part of which looks like it could be excused by the timing of payments and booking income on long-lead item construction projects. The Oil correlation: addressed in previous research and summarized again in Exhibit 2 – oil has been on a downward trend this year and this has not helped the “new” oil correlated GE. 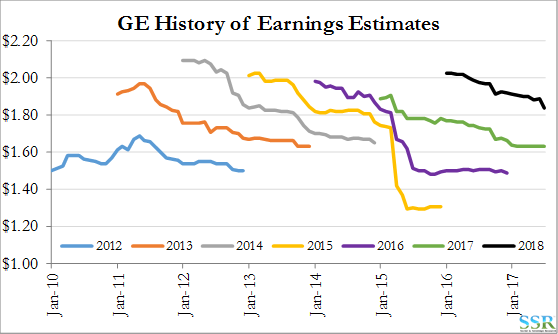 Since 2013, GE has at one point in the prior 3 years had an estimate for the year close to, or above, $2.00 per share and in every year that estimate has come down and the company has disappointed – the data is summarized in Exhibit 1 and shown in more detail in Exhibit 3. This continual slide – driven by poor expectation setting, in turn driven by over-confidence stemming from a poor understanding of competitive position or business conditions, or both, has to stop. Everyone knows this and everyone knows that Mr. Flannery can only win if he reverses this 7-8 years of serial disappointments. To do that he must define the starting point accurately, and the stock is weak because investors are losing confidence in what that starting point might be. GE, and Mr. Flannery specifically, cannot afford to reset a starting point that is again overly optimistic – consequently “how low could it go”. We expect guidance for 2017 to be below $1.50 per share at this point and we would not trust a number higher than that. Whether the stock is then a buy or not depends on the strategy that comes with the new guidance. When Dennis Reilley took the reins of Praxair in 2000, having not been offered the top job at DuPont, one sell side analyst on Dennis’ first PX call said the following: “Well done Dennis you have traded one company that cannot make $3.00 for another one that can’t make $3.00”. At the time PX had been forecasting more than $3.00 for EPS for several years and had not quite made it – DuPont the same. Similar to GE and the elusive $2.00 today. Dennis took a fresh look at PX and saw opportunities that his predecessor had not. On a split adjusted (apples to apples) basis, PX should make the equivalent of more than $11 per share in 2017. DuPont is expected to make $3.88 per share! 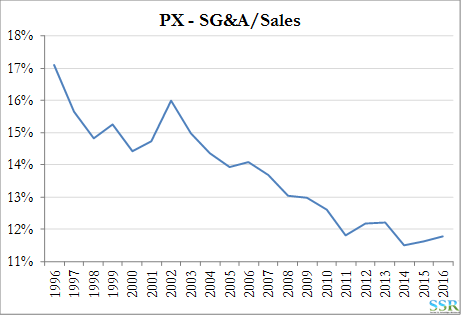 Exhibit 4 shows PX’s SG&A to sales reduction over time. True cost control – the company may need to be broken up completely if he cannot find a way to drive costs out otherwise and this is what Trian will likely push for if there is not success soon. Note that both Ed Breen and Seifi Ghasemi were able to find significant cost opportunities at DuPont and Air Products, respectively, almost immediately. Significant portfolio change. Starting with Energy. A complete rethink of the power business – targeting where the industry will be in 10 years – not where it was yesterday. For a slow-moving business, power is moving very quickly as renewable and storage costs come down. Free power in more than one state at certain times of the day with the frequency of this phenomenon increasing. The UK now counting several days when the country has not needed any coal based power generation for the first time since power was generated in the UK.